Here is a card I made for one of my friend’s mothers. She is turning 60 soon, and such a great milestone deserves a special card. This card uses two cuts from Sophie, the most recent Cricut Circle exclusive. Using my Gypsy, I added and welded a “60” in Storybook to the Sophie image on pg 44 of the handbook. I cut the silhouette at 3.25 inches and added highlights with a Spica pen. 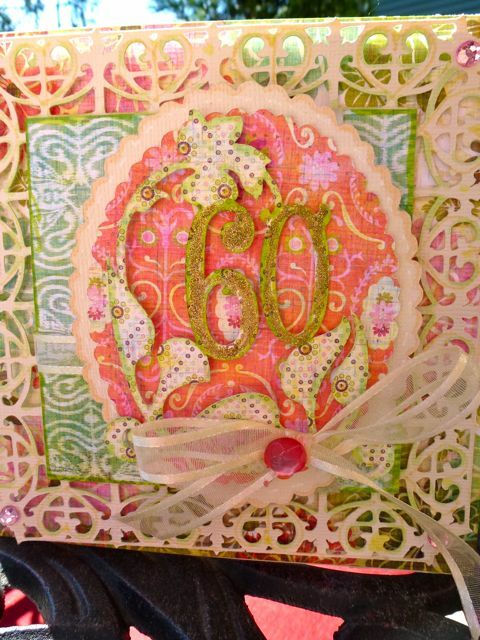 The “60” was more heavily colored and then glittered. It is pop-dotted over a 3.25 scalloped base which is then “stitched” without thread and attached via foam tape to the same shape cut at 3.75″ from Core’dinations Foundations in “Ice Cream” which is edged with a Copic (E000). The organza bow is attached with Beacon’s 3 in 1 glue with a Paper Trey Ink button – thank goodness for the color and variety that come with one of their button packages. Under that is a 3.75 square of patterned paper with organza ribbon and the next element is a Sophie doily from pg 36 cut at 5.25 inches. I edged with Copics and Spica pens added some additional sparkle. The final element is a square of patterned paper cut at 5.5 inches. All of the patterned paper is from Basic Grey’s Sweet Threads (6×6 inch paper pad) and you can see the “fabric” in it. I am told that the recipient likes green, fabric, and books – I only got two of out three, but I think it turned out nicely. Beautiful, feminine, and intricate. I am sure she will love it!! Beautiful layers, colors, and patterns!! Love the borders. I’m going to have to crack open my Sophie cart and use it! This card is stunning. 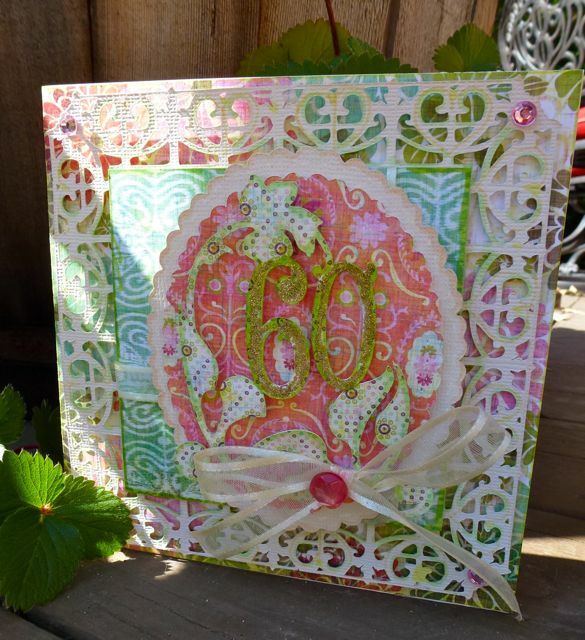 I absolutely love the papers you used…the colors are so feminine and soft, yet they manage to be fun and sweet. I can’t stop looking at this one. Just beautiful! Beautiful card!!! I love, love love that doily you cut. It’s going to make her day :D.
Great colors and of course you always do superb craftsmanship! I absolutely adore this card…the papers, the colors, the design….everything about it screams “special.” Just gorgeous!